Welcome to part 3 of 5 of our series Organizing and Taking Control of your Divi Web Design Business. In this series, we’re exploring several tactics, tools and strategies that will help you overcome the daily struggles that we all face as Divi Web Designers. From optimizing your daily routines, to creating systems and processes, to providing the best web design experience for your clients; we’re providing actionable items and steps that you can implement immediately with the purpose of helping you take control of your Divi Web Design business whether you’re a solo freelancer, a small agency or a remote team. Once a client has signed off on your proposal and is ready to get their new Divi website designed, the real fun begins. In all honestly, it is fun. Landing a new client, getting paid for doing work you love, getting to be creative and designing something that can help a business grow…it’s awesome. But there are also common struggles that we all face when every project starts up. Let’s dive into some ideas on how we can make this process better! The first step in a successful onboarding process is making sure the client is informed, prepared and on the same page. In our client documentation series, we explored how to create a website questionnaire which will provide you with much of the information you’ll need to not only create a proposal but also have a good read on the client. We also talked about creating a getting started page which highlights what you need from them to get started, your process, the tools you use, etc. But what also needs to be addressed is the expectations between both parties to ensure a successful web design experience. You can do this practically by creating a timeline in your contract or proposal or sending the client information on your process by showing your general timeline in more detail in your getting started page. Either way, you want the client to be ready, prepared and excited before getting content and designing. The link to Basecamp where they can sign in and see exactly what I need to get started. Once I get the initial logins and information I need, we talk in more detail about images and page content which we’ll cover next. I try my best not to overwhelm my clients up front which is very easy to do when you need logos, images, logins, content, emails, etc. So what’s proven successful for me so far is to take it one step at a time but stick to my standardized onboarding process for each and every project. Now, hopefully during the proposal process you’ve weeded out potentially difficult or problem clients before you get this point. One way to do that is to have perhaps a more extensive “initiation process.” I recently spoke with the guys at Artillery Media who run a successful Divi Web Design business in Lincoln Nebraska. They deal with numerous leads on a weekly and sometimes daily basis so they have a very robust sales funnel to help weed out potentially bad-fit clients. This is one option to consider for your business, to make a client fill out as much information as possible to ensure that they’re serious about moving forward. Here’s an example of their proposal outline that effectively educates the client on their process and visual guides them as to what to expect. 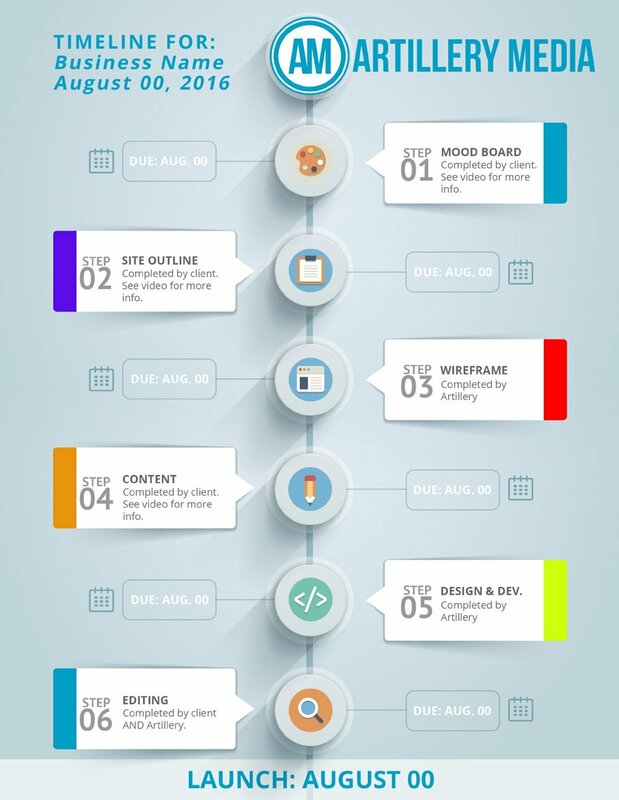 They have more to this initial proposal outline piece to help weed out clients who aren’t serious about getting started but this is a good example of how you can create a nice looking template to help you and your client stay on track with your process. And again, the initial onboarding step may look different depending on the size of your business and how many leads you’re juggling on a day to day basis. But regardless, coming up with a standardized process will be key for your business if you hope to be able to scale. Was it just me or did you shudder after reading that title? 🙂 There’s not doubt about it – getting content is one of the most frustrating and infuriating parts of the web design process. And depending on the client you’re working with, it can be a time consuming project killer. Now some few clients are organized and send you content quickly that’s perfectly planned out, but that’s not usually the case. Therefore it’s our job as web developers to make it VERY clear how we want the client to send their content and we need to make it easy for them to do so. If you’ve followed any of my posts here recently you know that I use and prefer to keep all my communication centralized as much as possible to avoid losing messages and data in email threads and texts. I use Basecamp to great effective for not only managing projects and communicating with my clients, but for collecting content. As mentioned above, I let the client know (usually in a easy to follow bullet list) what I need to get started. Once I have the initial information, I move on to collecting more detailed page content and images. How I guide my client to providing content all depends on how small or large the site is. In Basecamp, I typically set up a different thread for each major section of the site so clients can drop their information and images there. If there are large galleries, I’ll utilize dropbox for collecting all images and will set up the folder structure for them to easily drop their images in. Essentially what I’m doing is providing a visual and organized framework for the client to just drop in text, content, images and the information I need to get the ball rolling on design and development. I generally tell my clients I don’t get started until all content has been provided but in some cases you’ll be waiting on head shots, new photos, revised copy, etc. So I try to be lenient depending on the situation. The long and short of it is you want to make it as EASY as possible for the client to feel good about providing content because it can certainly feel overwhelming if they’re not prepared. Lastly, I highly recommend avoiding using email to collect content. You don’t want to be passing important logins and sensitive documents over email. You’ll want to make sure you’re using a secure platform to exchange content. You can use whatever project management platform you’re comfortable with (like Basecamp) but you can also use free tools like Dropbox, Google Drive and Content Snare which is a site that is dedicated to getting website content. Well I hope this post has inspired to create a standardized onboarding process for your clients if you don’t currently have one in place. And if you’re like me, you’re always wanting to improve your systems to get faster, save time and make things easy for your clients so test out some of these ideas to see if they work for you! Have any onboarding processes that you’d like to share with the community? Feel free to post them below! Creating a standardized process for designing and developing a Divi website is crucial to your productivity and well-being as a web designer. Though a website design project rarely goes exactly as planned, if you have a plan and path to stick to, that will save some serious time and keep you on track to hit deadlines when projects grow legs. Come back tomorrow to find out how you can create a standardized design and development process for your Divi Web Design business! Indeed I did shudder at the “Getting Content” title. One quick tip I can share that has helped with my clients & content delays – I emphasize “done is better than perfect” and then I follow up with “keep in mind, once your content is in, you can always tweak and update the language. It’s as easy as editing a word.doc”. That’s a GREAT point, Keith! I’ve found myself telling clients more and more that we can always make small tweaks while the site is built or is even live. Sometimes clients can’t visualize the site before seeing the design which I think leads to the issue of getting content. Thanks for your feedback and tip! No problem, John! You guys are a big inspiration for onboarding clients and creative, effective processes! This is amazing! Thank you for doing this series! I’ve been struggling to find a standard process flow that works for my team & clients. I absolutely LOVE the Getting Started page! Implementing that TONIGHT! Great to hear, Cynthia! Love hearing that this helped you and your team out. Yea a getting started page has been a game changer for me. And just wait until the post tomorrow drops 🙂 Hopefully it helps even more! Thanks Josh for your wonderful series. On a previous chapter you talked about offering complementary services, such as hosting. I see your prices and compared to the big beasts out there which offer plans a lot cheaper. Do you still think we have opportunity to compete in that market? How is your hosting business doing? Hey Marco! Funny you mention it, I’m leaning towards just doing referral based hosting moving forward because as a solo freelancer, it’s easy to get yourself into a support role. I’ve been fortunate that most of my hosting clients haven’t had too many issues, but when it comes to email, domain renewals and things like that, I’m finding out that it really is best to have the client manage that and give you (the developer) access to their cpanel. I’ve had pretty good success with my hosting but scaling would be an issue with no support team in place. If you have a small team in place, offering web hosting is a great way for recurring income but it has it’s complexities. And as a freelancer you need to be even more careful 🙂 I’ve joined Siteground’s affiliate program and am going to strongly recommend Siteground to all my clients moving forward. Actually, the main reason I started offering hosting was I was tired of clients getting set up on GoDaddy or subpar hosting, but by recommending Siteground at their basic start up price, it’s pretty competitive and you get a $ kick back with every purchase. Anyway, I hope that answers your questions! Thanks for reading and for your comments! I too shuddered at “Getting Content.” I have found that clients often have “blank page brain freeze”. So we help — because it’s easier to get them started by editing. And also reminding that content on the web can be viewed as a work in process. It’s not like print. Totally agree, Tanis. It’s a tricky thing to balance but I try to take it one step at a time and guide the client where possible to help guide them because it can feel overwhelming. Thanks for your feedback on this! Awesome to hear, Natalie! So glad this post helped you out and hopefully gave you some inspiration! Thanks for this amazing series Josh. I just lost a really important client in my niche by getting this process wrong. I knew she had very little time so sent her a list of all the things we’d need to get the job done right at the start, thinking it would be better than asking for things in dribs and drabs and interrupting her work process. Turned out it was all too overwhelming and she’s decided to postpone the job for 6 months. I’m learning a lot from how you manage everything! Basecamp looks like such a good solution for working with clients. I just wish they’d do a range of packages instead of the one flat fee. And yea getting content can be a very overwhelming process for a client. I’ve had some that send me everything at once and some that just can’t take more than one page or step at a time so I’ve tried to find a happy medium. Hope these ideas work well for you moving forward. Thanks again for your feedback on the post! Love it. Thank you for sharing this, Josh. Thanks for your feedback, Tim! Great article as always. Thanks for all you do for the Divi community. One question: A message on the Content Snare website says it hasn’t been launched yet. Thanks, Carolyn! I think you can email the folks there. I was thinking it was live already but I think you can try it out in beta to see if it would work well for you! And no problem – I love helping the community in any way I can. It’s been a life changer for me as well! No problemo, James! I’m looking forward to seeing the final product as it seems the beta feedback has been well-received. I really enjoyed this I will definitely be implementing some of these into my client processes. I am still shuddering at the getting content title. No problem, Matt. Looking forward to hearing how these ideas help moving forward! I’m keeping that in mind and thinking about expanding on this topic a little more as it could be a whole series (or course) for that matter 🙂 I think you’re right – it would probably help the community and newbies even more to go into more/actionable detail. Thanks for your feedback, Saba. Consider me on it! Loving this series and especially this post. Writing a new business model and plan and this is very helpful stuff. Thanks. Awesome to hear, Kris! Really appreciate your feedback and am so glad this information helped you out! Hi! Where can the services like Trello/Asana find their fit in a workflow?